I was a participant in a fundraising boutique event this past weekend, it was to raise money for the breast cancer treatments of a local woman. I donated the Think Pink wreath I made to their raffle, and at my table I also gave out Pink Ribbon Hershey Kiss treats. These were adapted from the great Hershey Ribbon tutorial by Brenda Quintana. 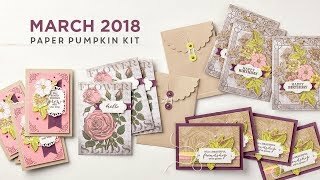 I say adapted, because I wanted to make a great number to hand out and I found Brenda's tutorial to be more for a favor type treat, more substantial (and time consuming) to create. To start, choose a 8.5 x 11 sheet of card stock in your choice of color to match your ribbon type. Cause Ribbons come in a variety of colors, and these would be easy to make for Relay for Life, Autism events, or other cause events. I stamped a design on the right side of the cardstock, trying to keep things neat and orderly, but not perfect - #1. Then I cut the paper along the 11" side at 1/2" measurements - #2. This will give you 22 ribbons. Do not worry about the design being perfect along that edge, you can see in - 2.a - that even imperfect stamping is not horrible, it really does look fine. Be sure you choose an image that has lots of design elements - swirls, stars, writing - more of a background type of design. 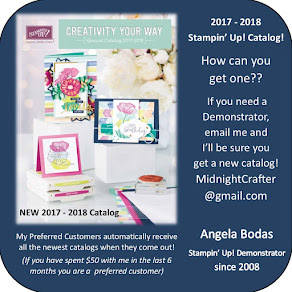 I then stamped a message, Take Care of Yourself in this case, along the blank side of the strips, facing the same direction as my background stamp -#3. I started my stamping about 1 finger width in from the edge to allow for the trimming of the ends of the ribbon. It makes it easier to read once the ribbon is folded, if you start your message on the left end and read it left to right normally. 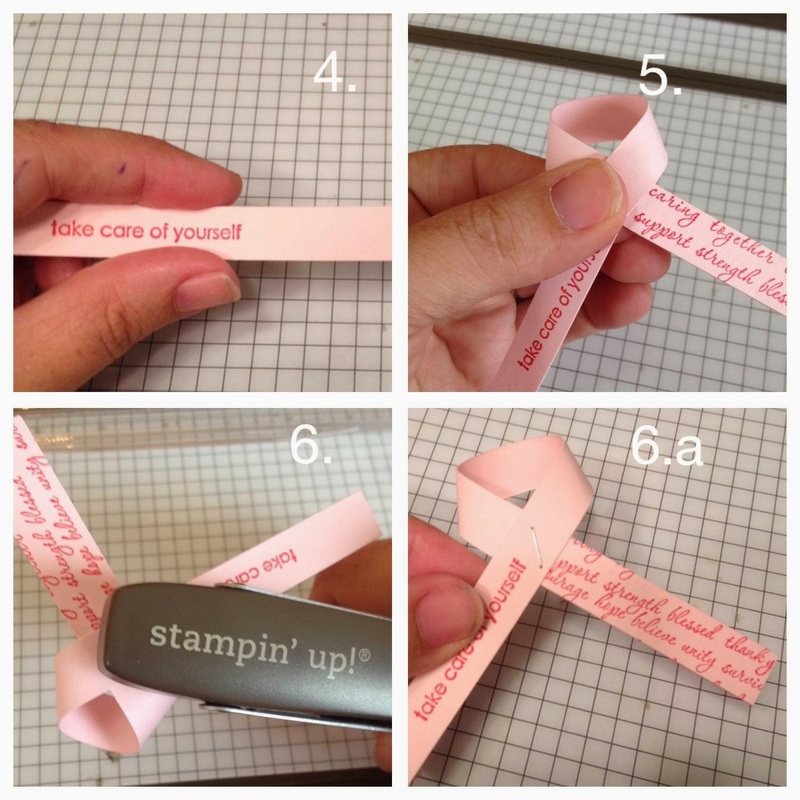 Holding your ribbon strip right side up - #4 , bring the right side around and under your left side #5. Then staple the two ends in the center - #6 & 6a. 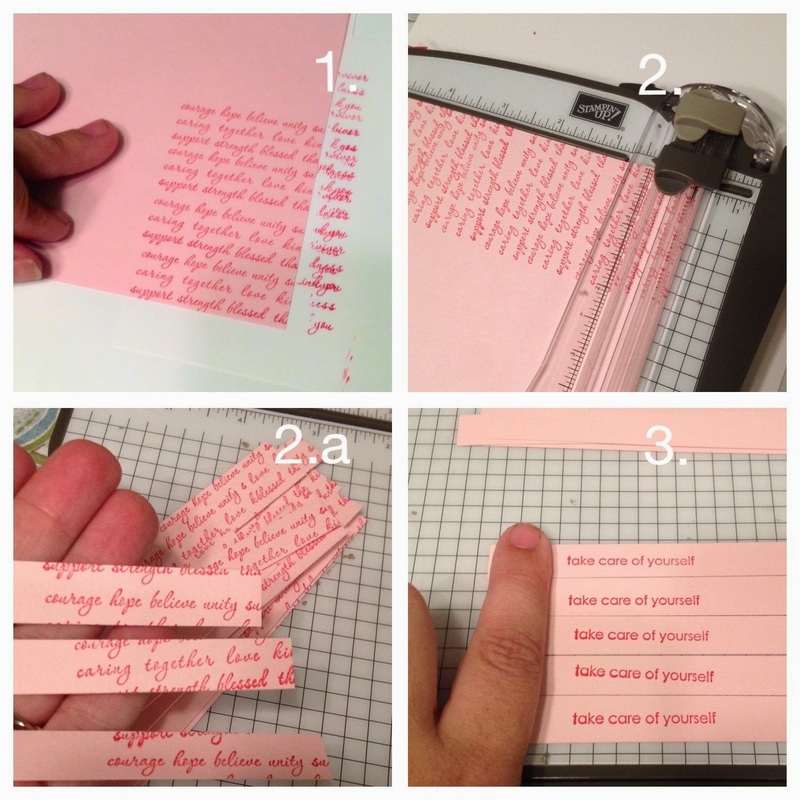 The edge of your message should end at the edge of your design strip, allowing space in the center to add the staple. Holding your ribbon with the loop at the top, trim each end with your scissors facing towards the top. Allow for your message to not get chopped off, and match the design side to this so the ribbon ends are of similar length. 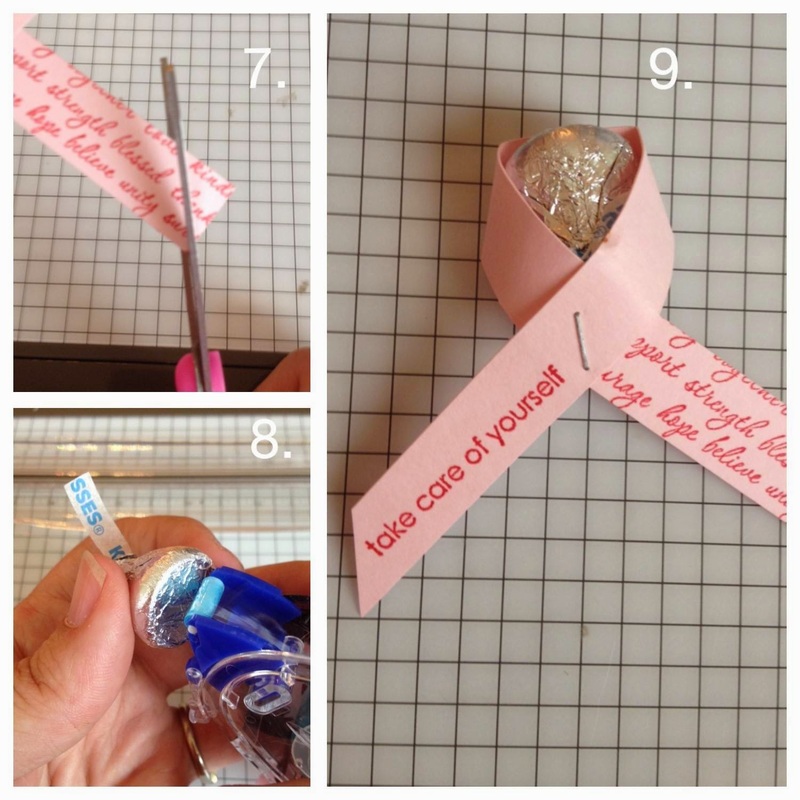 Swipe your snail across the bottom of a Hershey Kiss, and stick it into the center of your ribbon. Voila! Quick and easy, and minimal trimming and tape. These went together very easily, and I handed out about 60 of them. You could, if you wanted, add a stamp with your info or your organizations info to the back of the ribbons. but these are simple little treats perfect to give out at a group event.